While climbing do you often feel irritable, moody, or wracked with pain and uncomfortable pressure in your crotch and lower abdomen? Do you catch yourself upset and shouting at your friends and partners, but for no good reason? You may be suffering from something climbers have long known about but seldom discuss openly: Rope Drag Derangement Syndrome. Luckily, help is just around the corner. Graham Zimmerman on Freedom Rider’s crux pitch. 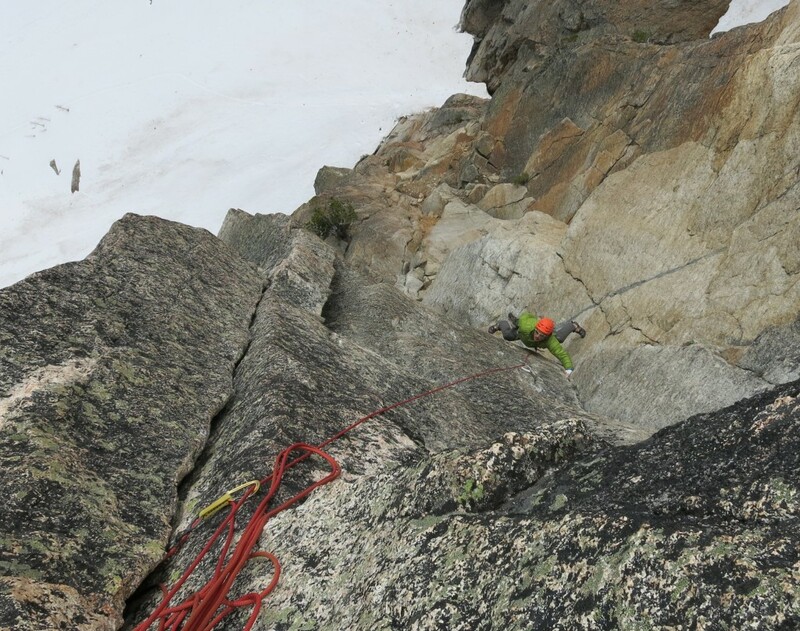 Back-cleaning gear and planning ahead resulted in a relatively straight rope line despite a complex, wandering pitch. from a belayer, forced to pull up armloads of slack and hold it in their teeth to execute a delicate highstep or slabby smear. Overcoming rope drag is primarily a function of proper planning, and learning to prevent drag can make your climbing faster, safer, and easier. Climbing a 10 pitch route in 5 rope-stretchers is fast and fun, but only possible if you effectively manage friction on your leads. The causes of rope drag are friction of the rope against ice, snow, trees, rock, carabiners, etc, as well as bends in the rope’s course. Some of these friction adding elements (grippy, textured rock vs smooth slabs) are beyond the control of climbers. But others, such as the rope’s course, are largely a function of how the pitch is lead. Which means that these factors can be dealt with by climbers. The first step in preventing rope drag, and climbing longer and smoother pitches, is to visualize the line you’re about to take. Draw an imaginary straight line from the starting belay to the finishing belay. If there are no physical barriers in the way, such as roofs or pillars, then the least amount of rope drag will be generated if your rope runs a course identical to this line. If you don’t know where the pitch ends, try to guess based on the topo and common sense. Use a variety of slings and draws, including lightweight 4′ “rabbit runners”, to allow your rope to approximate this course. There’s no doubt that stringing together long 70 or 80m pitches is easier when you are placing less pro, but these pitches should also be possible when placing adequate gear to fall safely. One technique is to place, and subsequently remove, a piece of gear which is clipped short (or directly to the rope) if a particular short crux breaks up otherwise easy climbing you would happily run out. Place a piece high, do the moves, and remove it so as not to cause unyielding rope drag higher up. Extending placements on easier terrain when a fall is unlikely will give you some greater margin for clipping short on crux pieces later on, but obviously every such decision is situational. Secondly, figure out how you will deal with large roofs, flakes, and corners. Contrary to popular perception, it is often desirable to run the rope behind or through these features, rather than simply clipping long slings to every piece and keeping the rope to the outside. Index’s famous Sagittarius pitch is a perfect example of where the wide flake/roof, which is underclinged and then chimneyed behind, doesn’t actually require the use of any long slings. Because the gap between the flake/roof feature and the wall never gets thin enough to pinch a rope, it is possible to simply run your rope straight behind/through the flake and only have a few short draws on your pieces of gear. Slinging gear short, when practical, will minimize fall distance, speed up climbing, and save slings for when they are truly needed Climbing long pitches and minimizing drag is not simply a function of throwing long runners on all your gear. Often there will be section on very long and circuitious pitches where the rope is running within inches of the crack. In these cases, runners are a waste. Just as you should begin the pitch by imagining the overall rope line you hope to draw, you can determine the necessity of slinging each piece of protection based on drawing a line from the previous bend/turn in the rope (or simply the last piece of pro) and trying to imagining where the next piece will be. Sling the piece you are currently placing to keep the rope line straight for this individual segment, and you will simply connect the dots on a straight rope line for the whole pitch. Just make sure that your gear itself is not directly in the rope’s path. Climbers can occasionally create their own rope-pinch points with the lobes of cams that they place. The caveat to this idea, which also applies to turning any roof with a crack in it (Squamish’s Blazing Saddles, Indian Creek’s Layaway Plan) is that your rope running behind the feature may actually push your cams into the crack, making them irretrievable. Place gear that can’t walk (due to constrictions) or keep your rope outside these cracks which your weighted rope will move into. Pinch points are common any time a vertical corner system is interrupted by a roof, climbed horizontally. If an obvious narrowing crack exists, fill the gap with a piece of gear to prevent the rope from wedging into it, which is worth stopping to place even if the piece wouldn’t hold a fall. A second strategy to prevent these pinches is to find a point of protection to clip the rope to on a short enough runner to mitigate the cord getting trapped. As long ropes become more common and gear continues to grow lighter and easier to place, it makes sense to climb fewer pitches and stretch out the rope between belays. Doing so successfully and safely is one of many skills to keep refining, and something that will benefit climbers across all mediums and skill levels. Something else that might be worth investigating is the use of DMM revolver carabiners. They have little micro pulleys built into them and will significantly reduce rope drag. I’ve started carrying one or two with me and when appropriately placed, (I.e. just before a long traverse) they will make a huge difference.